Review In A Nutshell: The Raven Boys is breathtaking. Maggie Stiefvater’s writing teleports you into Henrietta and Cabeswater, where the characters feel so alive and real. The Raven Boys is an atmospheric novel, following characters who seem to leap from the pages. Blue Sargent is the daughter of a psychic and lives in a house full of psychics, but her only ability is how she manages to serve as a battery, making it “louder” for those with the second sight. When she meets Gansey, Ronan, Adam, and Noah, she joins their quest to find the lost Welsh king Glendower. And a little fact that may be important to know- Blue has always been told she will kill her true love. And her aunt revealed she will fall in love this year. The plot is definitely interesting, filled with magic woven so beautifully into the small Virginia town of Henrietta, but it’s not the most gripping part of the book. The first half of the book feel slow, as the world and characters are established. However, after that first half, the book really picks up. Also, to be completely honest, I was spoiled for a lot of the twists and turns that happened in this book (and later on), but it didn’t take away from my enjoyment of it. Despite knowing most of what would happen, I still found myself absorbed into this story. While the plot is intriguing, this book is truly character-driven. All of the characters come to life in this novel. Blue is strong and independent, without being the cliche and boring “strong independent female protagonist”. She and her family are eccentric and strange, but charming in their own way. I absolutely loved reading about her life on 300 Fox Way. Meanwhile, Blue’s raven boys, Gansey, Ronan, Adam, and Noah, are all equally interesting. Gansey is the rich, spoiled kid who doesn’t understand how privileged he is yet would do anything for his friends. Ronan is damaged and hurting, and while he seems abrasive he deeply cares for his friends. Adam is the scholarship boy, from a broken home, who wants to be equal to his peers. And then there’s Noah, who is quiet and happy in the shadows of the rest of the group. The boys are all so different, but their friendship is believable and honest. I loved watching them develop, and I look forward to seeing them develop more in the later books. The setting is amazing. The magic is believable and built up gradually in a way to make it seem so possible. I imagine the fantasy aspect will only grow in the sequels. The mythology and magic system is completely unique and utterly fascinating. 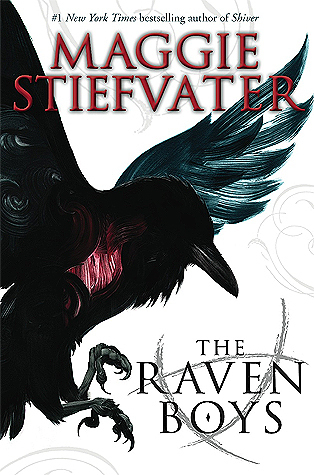 Although, what really makes it stand out is the fantastic writing style of Maggie Stiefvater. The images she creates are cinematic, the sentences seem so carefully crafted, and it is absolutely breathtaking. Even the most simple of statements feel profound with her writing. The Raven Boys is an atmospheric read, perfect for those searching for a haunting and enchanting tale.